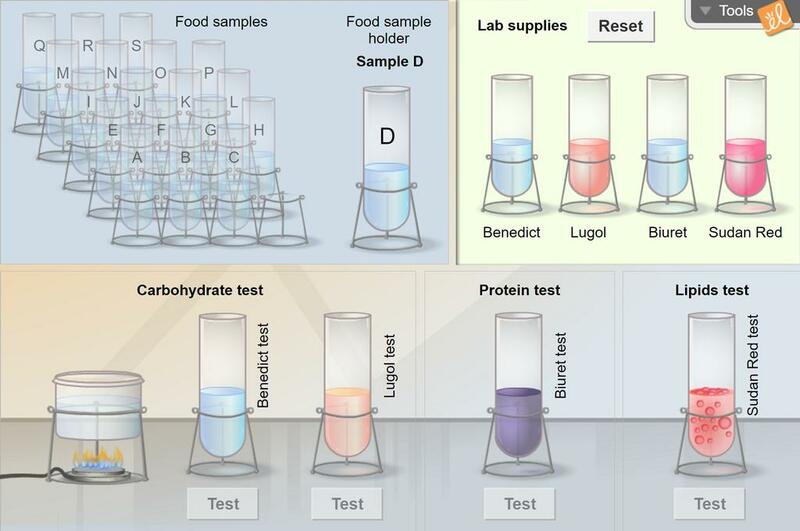 Use a variety of real-world lab tests to analyze common food samples in order to determine if the food is a carbohydrate, a protein, or a lipid. Tests that can be performed include: Benedict, Lugol, Biuret, and Sudan Red. I modified the Exploration guide to include a bit more research on the student's part because I use it in... (more) an IB class for students who missed the lab (we do exactly the same tests in real life that are on the Gizmo). I assign the guide as pre-reading and pre-lab work the night before the lab. I modified the Exploration guide to include a bit more research on the student's part regarding what the ... (more)tests do and what to expect. I assign that as pre-reading and pre-lab the night before the lab. Great for 9th grade lower level biology class. Very good activity from the reading. I plan on doing this to introduce the content before my custom lecture. ALthough this does not correlate with Florida's Biology EOC item specs, this would make a great enrichment for Macromolecules. The use of this gizmo finally cleared up the procedure for the hands-on version of this lab. Very helpful to use in place of the actual nutrient testing lab or to prepare students for the actual lab. This is a good to do before an organic compound lab. an excellent resource for nutrient testing!